epoxy coatings are available in many different finishes and levels of durability. Generally the thicker the coating the better and longer lasting it is. Epoxies are measured in mils of thickness and every mil can add additional cost. There is a new and very popular floor finish that is sweeping the design community called metallic epoxy. Learn about all the options available below. 100% solids resin or water based epoxy can be applied in a thin mil or high build application suitable for any area required for health code specs, clean rooms to home gyms. This type of epoxy coating has a consistent look and provides a durable long lasting finish but is one of the most cost effective types of coatings for floors. 8-10 standard colors with custom colors available for a small additional cost. Experience the elegance of granite or terrazzo floors. 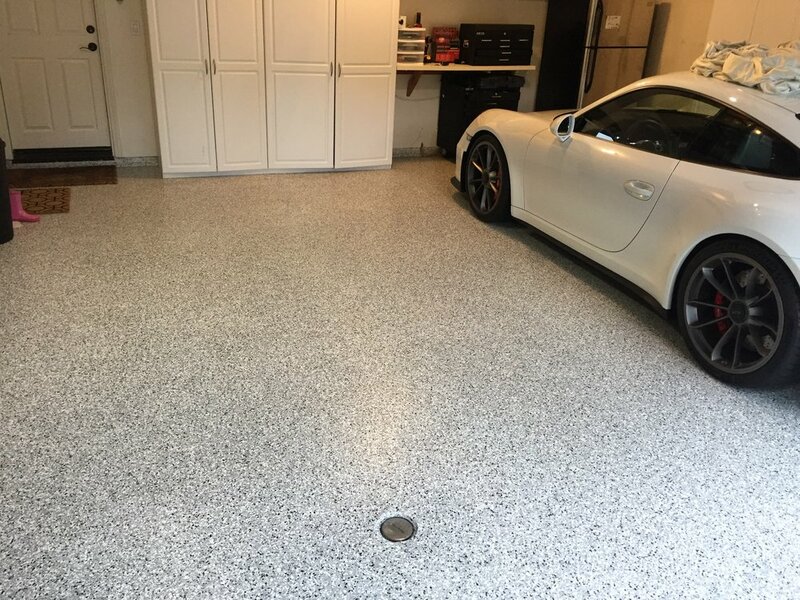 Our floor system combines high strength epoxy resins, color chip flakes and polyurethane’s to create a seamless, decorative floor for use in showrooms, restaurants, recreation rooms, garages, washrooms, and kitchens. These coating are chemical resistant, extremely durable, easy clean up, cost effective and perfect for both residential and commercial use on interior or exterior applications. This is a process of diamond grind mechanical floor prep (patch cracks and holes as needed), epoxy primer, followed by multi-colored vinyl chips broadcasted into a 2 part 100% solids pigmented epoxy, and finish sealed with a urethane top coat. We have over 12 color choice pre-made blends or you can create a custom blend using our base colors and selection of chip colors for an additional small fee. The whole process usually takes only 2 days to complete. 1 day accelerated system can be used as well for time constraint installs. Metallic epoxy is a unique product capable of producing custom one of a kind floors. Engineered with proprietary metallic additives creating an appeal, depth, character, and visual effect that flows uniquely when applied. Metallic epoxy provides a dynamic custom floor. The metallic appearance can be enhanced by several application techniques for a special look not to be duplicated. Several colors are available from bright blues and vibrant reds to soothing earth and grey tones. It is truly a showroom floor finish that just screams “contemporary, innovative and brilliant”…The Picasso of floors that are perfect for salons, restaurants, hotels, but can be used in any residential and commercial application. It’s very easy to clean and minimal to no maintenance.